All women in the South Sweden Health Care Region with breast cancer diagnosed aged less than 41 during the period between 1990 and 1995 were contacted in 1996 and offered germline mutation analysis of the BRCA1 and BRCA2 genes. Mutation carriers (n = 20) were compared with noncarriers (n = 201) for overall survival (OS) and risk of contralateral breast cancer (CBC). Mutation carriers were younger at diagnosis and more likely to have ER-negative, PgR-negative and grade III tumors. Median follow-up was 19 years. The 5-, 10-, 15-, and 20-year OS were 60, 45, 39, and 39 % for mutation carriers and 82, 70, 59, and 53 % for noncarriers, respectively (5-year log-rank P = 0.013; 10-year P = 0.008; 15-year P = 0.020; and 20-year P = 0.046). In univariable analysis, there was a trend for an inferior OS for mutation carriers (HR 1.8; 95 % CI 1.0–3.3). When stratified for use of (neo)adjuvant chemotherapy, an inferior OS was significant only for the subgroup of patients who did not receive chemotherapy (HR 3.0; 95 % CI 1.2–7.7). In multivarible analysis, BRCA1/2 mutation status was a significant predictor of OS when adjusting for tumor stage, age, and use of chemotherapy, but not when ER status was also included in the model. The 15-year cumulative risk of CBC was 53 % for mutation carriers and 10 % for noncarriers (HR 5.9; 95 % CI 1.9–18.6); among the noncarriers the risks were 5, 22, and 30 % for patients without close relatives having breast cancer, with second-degree relatives having breast cancer, and with firstdegree relatives with breast cancer, respectively. In conclusion, the poor prognosis of young BRCA1/2 mutation carriers with breast cancer is mainly explained by the prevalent occurrence of negative prognostic factors rather than mutation status per se, and can to at least some extent be abrogated by the use of chemotherapy. Breast cancer is a major cause of morbidity and death for women all over the world. Approximately 5–10 % of breast cancers are caused by the presence of constitutional mutations in highly penetrant genes with autosomal dominant inheritance. About half of these cases can be attributed to mutations in the tumor suppressor genes BRCA1 or BRCA2 , the proportion varies depending on genetic population, age of onset and family history. As opposed to the relatively modest impact of hormonal and lifestyle risk factors, a mutation in one of these two genes confers a four- to eightfold increase in the lifetime risk of breast cancer [2, 3]. It also substantially increases the risk for other cancers, in particular the ovarian cancer [4, 5]. Several studies have found evidence for allelic risk heterogeneity, genetic modifiers, and hormonal and lifestyle factors affecting penetrance [6, 7, 8, 9]. This means that the setting in which the mutation was detected, i.e., a clinical setting within a family with several cancer cases or a population-based setting, is important for cancer risks in the family and possibly even for the prognosis of the cancers. Once a mutation is found in a family, presymptomatic testing, surveillance, and prophylactic surgery decrease the cancer-specific mortality so that life expectancy approaches what it is expected to be in the general population . However, surveillance, and in particular prophylactic surgery, may have a negative impact on various aspects of life and health [11, 12]. In the end, it is up to the woman herself to decide on what kind of measures she wants to take in order to decrease her future risks of cancer. For that decision, it is important to know whether the prognosis of a BRCA-associated cancer is worse than, the same as, or better than that for a sporadic cancer. Furthermore, for the oncologist, it is important to know whether BRCA1/2 mutation status is an independent prognostic factor, or even a predictive factor, which should be taken into consideration when decisions about treatment are taken. It is now generally accepted that BRCA-associated ovarian cancer is more sensitive to standard platinum-based chemotherapy and has a superior, or rather less adverse, prognosis (at least short term) than sporadic ovarian cancer [13, 14]. For BRCA-associated breast cancer, the prognosis remains a matter of debate, despite many studies published over the last 15 years . Such studies should ideally report long-term follow-up, primarily because breast cancer is a disease where late recurrences are not unusual [16, 17, 18]. We conducted a population-based study among young women with breast cancer and a known BRCA1/2 mutation status. Our aims were to assess overall survival and risk of contralateral breast cancer. 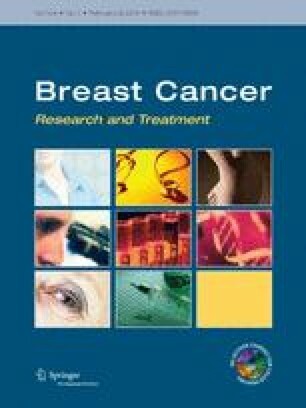 As previously reported , all women in the Southern Health Care Region in Sweden with an invasive breast cancer diagnosed with age less than 41 years during the period between 1990 and 1995 (n = 262) were contacted in 1996 and offered mutation analysis of the BRCA1 and BRCA2 genes; 225 were then alive and 37 were dead. Women who had died could be included if samples of their blood or tissue were available in the tissue bank. Mutation analysis was performed on 234 (89 %) of the patients, including 33 of the patients that were not alive; the others were excluded from further study. Mutation screening was originally performed using protein truncation test, single-strand conformation polymorphism, and denaturating high performance liquid chromatography. Mutations were verified by sequencing. Some initially BRCA-negative families with a strong family history of BRCA-associated cancer have been reanalyzed at a later point of time. In two of these families, pathogenic mutations were found, which were not detectable with the above mentioned mutation-screening protocol. They are now considered BRCA-positive. Twenty-three pathogenic mutations were found: 18 in BRCA1 and 5 in BRCA2. Out of the 234 patients tested, 4 have declined further study follow-up or could not be verified as having had an invasive breast cancer when pathological reports were again reviewed, only carcinoma in situ; these were therefore excluded. Six patients had metastatic breast cancer at the time of diagnosis (one of them being a BRCA2 mutation carrier) and were excluded. Three patients were excluded since they had already had another first primary breast cancer before 1990 (two of them BRCA1 mutation carriers), leaving 221 for the present analyses. Due to small numbers, BRCA1 (n = 16) and BRCA2 (n = 4) mutation carriers were grouped together for analyses. Current analyses were based on follow-up information through January 31, 2012. For the analysis of family history of breast cancer, information about family history at the time of study inclusion was collected from questionnaires and supplemented from medical records. This information was then confirmed independently in the National Swedish Cancer Register. Therefore, the results concerning family history are to be considered a minimum of the true figure in the families. Clinical data were abstracted from medical records and pathology reports. TNM stage was reclassified according to American Joint Committee on Cancer 7th edition. Vital status was controlled in the Swedish Census Register. Study endpoints were overall survival (OS) and incidence of contralateral breast cancer (CBC) for the pre-specified subgroups of mutation carriers and of noncarriers. Breast cancer specific survival (BCSS) was also analyzed. For CBC, patients were regarded as censored at the time of prophylactic mastectomy, death, distant spread of cancer, or date of last follow-up. For CBC, both invasive breast cancer and DCIS were included in the analyses. Age at diagnosis was stratified into three age groups to account for nonlinear associations. Selection of variables for exploratory subgroup analyses and for multivariable analyses was based on results from previous research. Tumor grade was not selected because of many missing values, especially among mutation carriers. ER, but not PgR, was considered for inclusion in the model. Differences in tumor, patient, and treatment characteristics between mutation carriers and noncarriers were tested using Fisher’s exact test for all covariates except for age, where the difference in median age was tested using the Wilcoxon rank sum test. For univariable analysis, OS and CBC were estimated using the Kaplan–Meier method and compared using the log-rank test. For the calculation of hazard ratios and for multivariable analysis, the impact of different prognostic factors on OS and CBC were assessed by the Cox proportional hazards model. All tests were two-tailed. All analyses were conducted using the R statistical package. For the discussion part, P values below 0.05 were considered statistically significant. Patient, tumor, and treatment characteristics are listed in Table 1. Compared with noncarriers, mutation carriers were younger at diagnosis (median 34.5 vs. 37.0 years; P = 0.002) and more likely to have ER-negative (87 % vs. 46 %; P = 0.003), PgR-negative (80 % vs. 38 %; P = 0.002) and grade III (83 % vs. 40 %; P = 0.005) tumors. No difference was seen between the groups for TNM stage (P = 1). Among mutation carriers, 13/20 (65 %) received adjuvant or neoadjuvant chemotherapy, and none received adjuvant endocrine treatment. Among noncarriers, 89/201 (44 %) received chemotherapy and 34/201 (17 %) received endocrine treatment. Chemotherapy regimens used were CMF-like (79 %), anthracycline-based (20 %) and unknown type (1 %). Median follow-up for OS was 19.0 years for women alive at the end of follow-up. In univariable analysis, as seen in Table 2, characteristics associated with an inferior OS in the entire cohort were higher TNM stage (P < 0.001), having received (neo)adjuvant chemotherapy (P < 0.001), and having a PgR-negative tumor (P = 0.045). There was a trend for a poorer prognosis for patients with ER-negative tumors (P = 0.21). In the subgroup of noncarriers, also younger age at diagnosis was associated with an inferior OS (31–35 vs. 36–40 years HR 1.4; ≤30 vs. 36–40 years HR 2.5; P = 0.02). In the smaller subgroup of mutation carriers, no markers were associated with a difference in OS (all P > 0.3 except for TNM stage where P = 0.08). At the end of follow-up, 12/20 (60 %) mutation carriers had died, all from breast cancer, whereas 94/201 (47 %) of the noncarriers had died. There was a trend for worse survival among mutation carriers compared with noncarriers (HR 1.8; 95 % CI 1.0–3.3) (Fig. 1). The 5-, 10-, 15-, and 20-year OS was 60, 45, 39, and 39 % for mutation carriers and 82, 70, 59, and 53 % for noncarriers, respectively (5-year log-rank P = 0.013; 10-year P = 0.008; 15-year P = 0.020; and 20-year P = 0.046). As seen in Fig. 2, for the subgroup of patients with ER-negative tumors no difference in OS was observed between mutation carriers and noncarriers (HR 1.3; CI 0.6–2.8). Out of the 12 mutation carriers who died, 11 died of their first breast cancer and one had a distant recurrence of breast cancer after having had a CBC; she probably died of the CBC. Out of the 94 noncarriers who died, 82 died of their first breast cancer, 4 had a distant recurrence of breast cancer after having had a CBC, one died of a myocardial infarction, 2 died of unknown causes (possibly breast cancer), and 5 died of other malignancies (radiation-induced pericardial mesothelioma, radiation-induced sarcoma, colon carcinoma, cholangiocarcinoma, and anaplastic astrocytoma, respectively). Analysis of BCSS and OS thus showed similar results (data not shown). None of the 8 mutation carriers who was alive at the end of follow-up had been diagnosed with ovarian cancer. Six of them had a subsequent prophylactic oophorectomy at a median of 9 years (range 1–18 years) after breast cancer diagnosis. Among patients who received chemotherapy, mutation carriers had a prognosis comparable to noncarriers (HR 1.1; CI 0.5–2.5). Among patients who did not receive chemotherapy, mutation carriers had a worse prognosis compared with noncarriers (HR 3.0; CI 1.2–7.7) (Figs. 3, 4). In this subgroup no multivariable analysis or further stratification was possible due to small numbers. Instead, factors with known prognostic importance are listed in Table 3. As was observed in the entire cohort, BRCA-associated tumors were more likely to be grade III and ER-negative also in the subgroup of patients that did not receive chemotherapy. Multivariable analysis for OS was performed and included mutation status, age, TNM stage and use of chemotherapy (Table 4). In this model, mutation status and TNM stage were associated with OS. When ER status was also included in the model, only TNM stage remained associated with OS at P < 0.05 (data not shown). The 15-year cumulative risk of CBC was 53 % for mutation carriers and 10 % for noncarriers (HR 5.9; CI 1.9–18.6). Among noncarriers, the 15-year cumulative risk of CBC was 5, 22, and 30 % for patients without close relatives with breast cancer, for patients with second-degree relatives with breast cancer, and for patients with first-degree relatives with breast cancer, respectively (second-degree relative HR 4.7; CI 1.3–17.8, first degree relative HR 6.4; CI 1.7–23.9). In the present study, we compared the OS and the risk of CBC between BRCA1/2 mutation carriers and noncarriers in a population-based cohort of young women with early breast cancer. In univariable analysis, a trend for an inferior OS was seen for mutation carriers, and we could conclude that this was not due to second primary tumors, e.g. ovarian cancers or other competing deaths. When stratified for use of chemotherapy, the inferior OS was only significant for the subgroup of patients who did not receive (neo)adjuvant chemotherapy. It should be noted that both among patients who did and among patients who did not receive (neo)adjuvant chemotherapy, BRCA-associated tumors were more often grade III and ER-negative than non-BRCA-associated tumors. In multivariable analysis, the inferior OS for mutation carriers remained significant when adjusting for tumor stage, age and chemotherapy. When ER status was included in the Cox proportional hazards model, mutation status was no longer significantly associated with OS, possibly due to the decreased power with ER-status missing in 5/20 of the mutation carriers. In this model, ER status was also not associated with OS. We acknowledge that results from multivariable analyses should be interpreted with caution in small samples, and that the impact of ER status in particular is difficult to assess due to missing values, few ER positive tumors in the subgroup of mutation carriers, and inadequate endocrine treatment. The prognosis of BRCA-associated breast cancer has been comprehensively summarized by Bordeleau et al. in 2010. The authors concluded that most of the more recent studies have failed to demonstrate a significant difference in OS between mutation carriers and noncarriers. It is, however, still a matter of debate whether the unadjusted or adjusted prognosis is worse, the same, or better for mutation carriers with breast cancer compared with sporadic cases. Multiple studies, including our own, have found evidence for an increased benefit of chemotherapy for mutation carriers compared with noncarriers. Two of these studies used a retrospective anonymized design with analysis of Ashkenazi founder mutations in archived paraffin-embedded tumor blocks, avoiding survival bias and inclusion bias, but raising questions about the generalizability to other populations. Robson et al. found that BRCA1 mutations were an independent predictor of breast cancer mortality in univariable analysis. When stratified for chemotherapy, this inferior prognosis was only seen in the subgroup that did not receive chemotherapy, similar to the findings in our study. Rennert et al. found no difference in unadjusted or adjusted hazard ratios for breast cancer mortality between mutation carriers and noncarriers. For overall survival, they found an interaction between BRCA1 mutation status and chemotherapy. In 2012 and 2013, two studies have been published on the issue of prognosis, which are superior to previous studies in terms of adjustment for known prognostic factors and how modern the given treatment was [22, 23]. In a prospective cohort study, Goodwin et al. compared BRCA1/2 mutation carriers with breast cancer to women with sporadic breast cancer. The majority of the mutation carriers received adjuvant chemotherapy. In univariable analysis, distant recurrence and OS were inferior for BRCA2 mutation carriers, but not for BRCA1 mutation carriers. After adjustment for age, tumor stage and grade, nodal status, hormone receptors, and year of diagnosis, the difference in distant recurrence and OS between BRCA2 mutation carriers and women with sporadic disease was no longer observed. The authors concluded that the adverse prognosis for BRCA2 mutation carriers seems to depend on the presence of more adverse tumor characteristics at diagnosis rather than mutation status per se . Huzarski et al. estimated a 10-year OS for breast cancer patients with a known BRCA1 Polish founder mutation status, and found no significant difference in univariable analysis. In multivariable analysis, which included most of the clinically important prognostic factors apart from tumor grade, BRCA1 mutation carriers had a poorer 10-year OS. They also found a significant interaction between BRCA1 mutation status and effect of chemotherapy, meaning that the benefit of chemotherapy was greater for mutation carriers than noncarriers . We believe that the inferior prognosis for mutation carriers seen in our study is mainly caused by the more prevalent occurrence of negative prognostic factors, such as ER-negativity and high tumor grade in the highly proliferative BRCA-associated tumors . Since ER-negativity is rather closely associated with high grade and high proliferation, a simple way of visualizing this is to stratify the cohort for ER status; the Kaplan–Meier curves for ER-negative mutation carriers and ER-negative noncarriers are similar (Fig. 2). Furthermore, this inferior prognosis for mutation carriers can probably be abrogated by the use of (neo)adjuvant chemotherapy, mainly because tumors with BRCA-associated features such as high proliferation and ER-negativity in general derive more absolute benefit from chemotherapy [25, 26], but possibly also because BRCA1/2 deficiency per se is a predictive factor for sensitivity to some types of chemotherapy [27, 28]. In the study by Huzarski et al. , more than 90 % of the mutation carriers received chemotherapy, which is likely the reason why no difference in OS was observed in univariable analysis in their study. Our study confirmed a high risk of CBC in BRCA1/2 mutation carriers with early-onset breast cancer; the 15-year risk was 53 %. Furthermore, among noncarriers with a first- or second-degree relative with breast cancer an increased risk of CBC was observed. This group of patients is likely to include not only some women with mutations in other highly penetrant or moderately penetrant breast cancer genes, as well as some with an increased risk of breast cancer in the family caused by multifactorial/polygenetic factors, but also a few women with a BRCA1/2 mutation that had evaded detection [29, 30, 31, 32]. Rhiem et al. recently reported data on risk of CBC in a large cohort of German breast cancer patients from high risk families with a known BRCA1/2 mutation status. They found that the 25-year cumulative risk of CBC was higher for noncarriers with a first breast cancer before the age of 40 years (28 %) than for mutation carriers with a first breast cancer at the age of 50 years or later (BRCA1: 22 %; BRCA2: 16 %). For BRCA1-carriers with a first breast cancer before the age of 40 years, the 25-year cumulative risk of CBC was 55 %; for BRCA2-carriers it was 38 %. These results are in line with the findings in our study, and has implications for the use of contralateral prophylactic mastectomies in young breast cancer patients with BRCA1/2 mutations or a positive family history. The strengths of our study are the population-based design, its very high inclusion rate minimizing survival bias and inclusion bias, the known BRCA1/2 mutation status for all included patients, long follow-up time, information on tumor and patient characteristics, treatment, relapses and death. There are a number of limitations: First and most notable a small number of patients. Second, no separate analyses of BRCA1 and BRCA2 mutation carriers could be done. Third, the adjuvant treatment that was given is now outdated. As an example, adjuvant endocrine treatment was only given to a third of the patients with ER-positive breast cancer; if all of them would have received it, as is done today, the difference in OS between mutation carriers and noncarriers would most likely have been even more pronounced. On the other hand, it is likely that modern chemotherapy regimens and indications [25, 26], which are based on tumor biology rather than tumor stage as was the case in the nineties, would diminish the difference in OS between the groups. Recent studies have reported promising results for mutation carriers treated with Cisplatin [28, 34] and PARP inhibitors . In future, these and other drugs might render a better prognosis for at least some mutation carriers compared with noncarriers. However, despite the availability of modern treatment regimens and more extensive use of chemotherapy, endocrine, and targeted therapy, the prognosis for young women with breast cancer still remains unsatisfactorily poor. In the case of BRCA1/2-associated breast and ovarian cancer, identification of a mutation in the family makes presymptomatic testing, surveillance, and prophylactic surgery possible; these measures have a positive effect on the life expectancy that is superior to the improvement in breast and ovarian cancer prognosis that we have seen over the last decades . It is therefore very important to identify mutation carriers. In conclusion, early-onset breast cancer diagnosed in the early nineties was associated with a poor prognosis. With the limitation of a small study sample, our study suggests that a positive BRCA1/2 mutation status is associated with a pronounced severity of the prognosis, which may, however, be abrogated by the administration of (neo)adjuvant chemotherapy. BRCA1/2 mutation carriers as well as noncarriers with a positive family history indeed have an increased risk of contralateral breast cancer compared with patients with sporadic disease. The authors thank Professor Åke Borg and Professor Håkan Olsson. The study was approved by the ethical committee of Lund University Hospital, and complies with the current laws of Sweden. The research was funded by grants from Skåne County Counsil’s Research and Development Foundation, The Swedish Breast Cancer Association (BRO), and BioCARE.